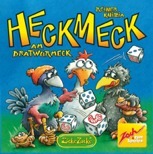 “Heckmeck am Bratwurmeck” is a turbulent dice game within the popular “ZickeZacke” chicken world. In the middle of the table on a “grill” there are 16 “barbecue worms” of distinct value waiting to be snatched by the chickens. To this end a player picks the identical die symbols from her dice roll and keeps on rolling with the remaining dice. If her dice reach the value of a displayed “barbecue worm portion”, she may take it – even from the stacks of her fellow chickens! “Heckmeck am Bratwurmeck” is the iconic dice game for smart birds that smelled a “barbecue worm”.